When it comes to politics and the church, you usually see one of two extremes. You see one church that is engaging to politics where the pastor addresses voting for a certain candidate and making sure the right policies get voted one. The other extreme is one church that just withdraws from the political landscape. They have nothing to do with politics which also includes their discussions with one another. While the church is a holy nation unto God itself (1 Peter 2:9) that does not mean we should not care about the politics of a nation especially here in the United States of America. It also means we can be faithful Christians as we engage politics whether by how we vote or express our political view. 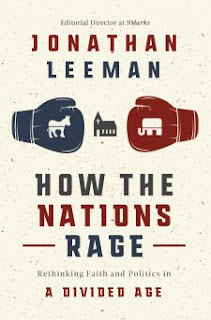 Jonathan Leeman's new book, How The Nations Rage: Rethinking Faith and Politics in a Divided Age, is a perfect book for such a time as this as we continue to see heated political discussions inside and outside the church. Leeman wrote that while the political landscape of our country has changed for the past few years, the church has not. We still worship the same Savior and still have the same citizenship even though the nation we live might see us as a blemish in society. The church is still committed to be law abiding citizens as long as it does not conflict with God's Word. Leeman goes on to say that we must invest our political hopes in the church above all. Does that means the church takes over the culture at large? What Leeman is saying is what Scripture says about our true citizenship. All who are in Christ are citizens of heaven, God's kingdom. We are ambassadors to the people in every nation we live and each church is an embassy representing the Kingdom. We are sojourners and exiles on earth and waiting for a Savior to appear to take us home. When we become a believer the most important thing about us is not our gender or race, but our union with Christ. Leeman goes on to say that our baptism testifies that we are united with Christ and we should represent Christ's "righteousness, justice, and love everywhere we go." The rest of the book is a reminder of what the church is to be in the culture. Yes, we should be involved in politics and not put our head in the sand. The church is called to represent the Kingdom, as mentioned above, regardless of what nation we live in. There is nothing wrong with being patriotic in the nation we live in, but we should be patriotic for the Kingdom because in the end, that is where our citizenship truly lies. Every year there are books that every Christian must read because it covers the difficult cultural issues of our day. How The Nations Rage is a book the most important book Christians need to read this year. Thanks Booklook Bloggers for letting me review this book.